Taler is registered trade mark, owned by Aldigus, JSC. 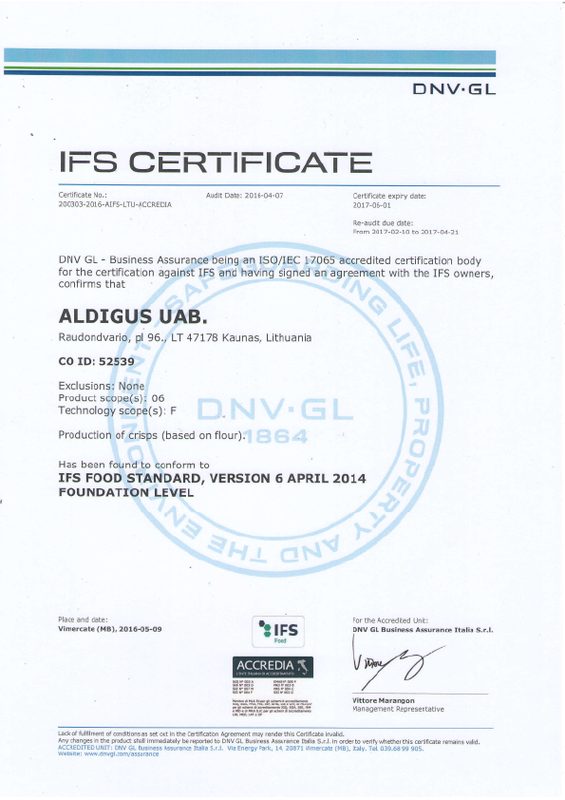 Aldigus, JSC is a private equity company, founded in 1989, European Union (Lithuania). We are wheat flour snacks manufacturer, agressively expanding in foreign markets. Our head office located in Lithuania (EU). We exporting our production in Europe, USA and Asia. Experienced – we hire only professional technicians with at least 5-10 years experience and usually many more. Quality – we prides themselves with having a strong dedication to the principle that a quality product is its own best form of advertising. Our employees are the best craftsman in the area. Easy to do business – we are always trying to find the best solution for our clients in order to meet our clients needs. Our clients grow faster with us! Quality performance is a commitment to excellence by each Aldigus, JSC employee. It is achieved by teamwork and a process of continuous improvement. Taler is dedicated to being the leader in providing quality products and services that meet or exceed the expectations of our customers. Taler’s quality approach is based on the idea that every person in the company has responsibility for – and contributes to – the quality of Taler’s production. By establishing a Quality Management System, Aldigus, JSC leverages the engagement of executive leadership, line management, and many functions within the workforce, as well as suppliers and customers, in order to meet and exceed customer expectations. analysis and critical control point principles. Dowload our presentation [2,91 MB].